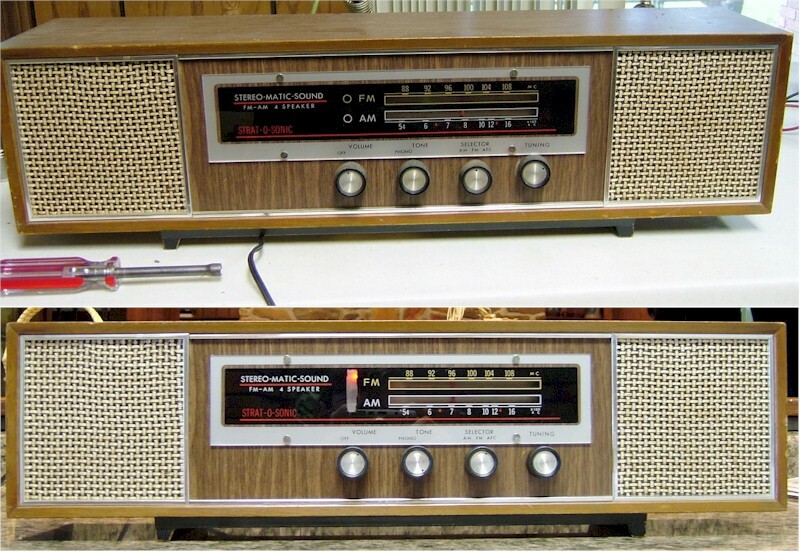 Despite the name, no, this is not really a stereophonic receiver, as its four built-in speakers are simply connected together in series-parallel. An external matrix decoder and amplifier was required to receive FM stations in stereo. Neon indicator lamps beside the dial scales display the currently-selected band on this radio. This is shown in the pictures. Selecting the phono input turns both off. On some early-production versions of the Commodore 746-�like mine-�these neon lamps are placed too high on the chassis and do not line up properly with the scale! The area beside the words �FM� and �AM� originally was covered over with opaque paint except for two clear, unpainted circles that the neon lamps had to line-up with. On these early-production 746s, with the lamps placed up too high, no light got through to the dial. This was a design flaw that Commodore quickly fixed in mid- and late-production versions. Nothing can be done to fix the misalignment issue on these early versions, but as part of the restoration process, I did carefully sand off some of the opaque paint so the neon lamps would at least be visible in operation.